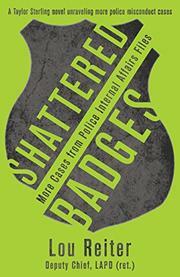 A Santa Fe, New Mexico-based police consultant works cases across the United States, investigating possible police corruption, in Reiter’s (Broken Badges, 2013) procedural novel. Taylor Sterling, a retired deputy chief of the Los Angeles Police Department, now makes his living consulting. He’s often called in by state insurance pools in response to civil suits. In Indiana, for example, Roscoe Blunt files a complaint after serving eight years for a murder that he didn’t commit. The real killer is now behind bars, and Roscoe’s free, but his conviction may have been the result of cops’ dirty dealings. Taylor looks into fatal shootings as well: New Jersey Officer Ray Fay gunned down a man who appeared to be armed, but wasn’t, in a Days Inn parking lot; and a small-town Kentucky SWAT teams’ raids have sometimes ended in deaths. Although some incidents are simply tragic mistakes, others stem from shoddy police work or outright criminal behavior, including harassment and bribery. Taylor, who does ride-alongs to get a feel for each city’s department or agency, uses his decades of expertise to decide how to handle each matter. Reiter’s novel is split into six novella-length cases, all tied together by the investigating protagonist. The author develops his secondary characters exceedingly well, with a sympathetic back story for Officer Fay and details on a victim who turns out to have been fairly unscrupulous. He also sporadically interrupts stories with helpful elucidation (on the history of SWAT units, for example), which readers can conceivably skip, if desired. The main narratives are layered with colorful language, as when a car “explode[s] in a shower of sparks, finally shooting a litter of debris along the shoulder of Highway 54.” Taylor is more of a guide to the action than he is a participant in it, merely offering advice before moving on to the next city. Some nuances of his characterization are welcome (such as the fact that he’s a foodie), but his relationship with real estate broker Sandy Banks serves little narrative purpose. A set of cases whose details are more riveting than their protagonist.